Analog thread depth gages permit gaging and measuring of threads in one single step. 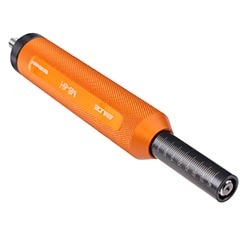 By pushing the spring loaded scale sleeve into the handle, the fully cut thread depth can be read off quickly and precisely from the display. These gages are used in components with identical thread dimensions but different thread depths as well as for setting up a thread depth for any kind of internal thread production. The GT-GR-LD is a manually operated gage for gaging threads and their depths in one single step. The TD-Bit-GUT is an automatically operated gage with a bit holder for use on cordless and air screwdrivers or drill machines in order to check any thread and its depth in one single step.